Below are a series of rebuttals of the most common climate alarmists’ claims such as those made in the recently released Fourth National Climate Assessment Report. The authors of these rebuttals are all recognized experts in the relevant scientific fields. The rebuttals demonstrate the falsity of EPA’s claims merely by citing the most credible empirical data on the topic. For each alarmist claim, a summary of the relevant rebuttal is provided below along with a link to the full text of the rebuttal, which includes the names and the credentials of the authors of each rebuttal. There has been no detectable long-term increase in heat waves in the United States or elsewhere in the world. Most all-time record highs here in the U.S. happened many years ago, long before mankind was using much fossil fuel. Thirty-eight states set their all-time record highs before 1960 (23 in the 1930s!). Here in the United States, the number of 100F, 95F and 90F days per year has been steadily declining since the 1930s. The Environmental Protection Agency Heat Wave Index confirms the 1930s as the hottest decade. James Hansen while at NASA in 1999 said about the U.S. temperature record “In the U.S. the warmest decade was the 1930s and the warmest year was 1934”. When NASA was challenged on the declining heat records in the U.S, the reply was that the U.S. is just 2% of the world. However, all the continents recorded their all-time record highs before 1980. Interestingly while the media gives a great deal of coverage to even minor heat waves to support the case that man-made global warming is occurring, the media tends to ignore deadly cold waves. But in actual fact, worldwide cold kills 20 times as many people as heat. This is documented in the “Excess Winter Mortality” which shows that the number of deaths in the 4 coldest winter months is much higher than the other 8 months of the year. The USA death rate in January and February is more than 1000 deaths per day greater than in it is July and August. Clearly, there is no problem with increased heat waves due to Climate Change. The long-term linear trend in the number and intensity of global hurricane activity has remained flat. Hurricane activity does vary year-to-year and over longer periods as short-term ocean cycles like El Nino/La Nina and multidecadal cycles in the Pacific (PDO) and Atlantic (AMO) ocean temperature regimes favor changes in activity levels and some basins over others. Credible data show this is true despite much better open ocean detection than before the 1960s when many short-lived storms at sea would have been missed as there were no satellites, no aircraft reconnaissance, no radar, no buoys and no automated weather stations. Landfall counts are more reliable. This data shows that the number of U.S. landfalling hurricanes and major hurricanes has been on the decline since the late 1800s. However, the impacts on the United States has varied considerably with time, with very active seasons giving way to long lulls during which the public forgets the lessons from past storms and the risks of settling in vulnerable areas. The regions targeted vary too. The period from 1926 to 1935 was very active in the Gulf area. After decades of no impact storms, there were 8 major devastating storms on the east coast from 1938 to 1960 then a 25-year lull until Gloria and then Hugo began another active era. This century Isabel in 2003, Charley, Frances, Ivan and Jeanne in 2004 and Dennis, Katrina, Rita and Wilma in 2005 all made landfall on the mainland. 2005 holds the record for 5 category 4 and 4 category 5 impact storms. At the time, some speculated this was the new norm for the Atlantic due to climate change. However, after the active 2005 season and before the landfall of two major storms on the U.S. in 2017, the U.S. had gone 4324 days (just short of 12 years) without a major hurricane landfall, exceeding the prior record 8-year lull in the 1860s. Harvey in 2017 was the first hurricane to make landfall in Texas since Ike in 2008 and the first Category 4 hurricane in Texas since Hurricane Carla in 1961. Note that there has been no increase in Texas in either hurricanes or major hurricanes. In 2017, Irma was the first landfalling hurricane and major hurricane in Florida since Wilma in 2005. This was also after a record lull – 4439 days. The previous record lull back to 1851 was 2191 days from 1979 to 1985. Michael whose tight core winds did major damage on a portion of the Florida panhandle in 2018 had the 20th lowest pressure for an Atlantic storm and was third lowest for a storm making landfall behind the Labor Day Hurricane in 1935 and Hurricane Camille in 1969. In short, there is nothing unique or unprecedented about recent hurricane seasons or hurricanes. Active Atlantic seasons like 2004 and 2005 and 2017 were similar to 1893, 1926, 1933, 1950 and 1995. 1893 had 5 major hurricanes two of which both caused over 2000 deaths making that year the deadliest on record at that time. 7 years later in 1900, the Great Galveston hurricane killed up to 12,000, making it the most deadly in U.S. history. Strong hurricanes like Maria in 2017 with devastation on the Caribbean islands are not unique. The Great Hurricane of 1780 killed 27,500 while ravaging the Caribbean islands with winds estimated over 200 mph. It was one of three hurricanes that year with death tolls over 1000. The heavy rains associated with slow moving Harvey and Florence led to claims that slow movement was related to climate change. Careful analysis of the data shows a flat linear trend in storm motion over land for over the last half century. The most recent (2018) U.S. Government analysis of the 36 most costly hurricane disasters in U.S. history, showed that increasing damages are due to increasing population density and infrastructure vulnerability, not due to storm intensity. Tornadoes are failing to follow “global warming” predictions. Strong tornadoes have seen a decline in frequency since the 1950s. The years 2012, 2013, 2014, 2015 and 2016 all saw below average to near record low tornado counts in the U.S. since records began in 1954. 2017 rebounded only to the long-term mean. 2018 as of the end of May is ranking below the 25th percentile. This lull followed a very active and deadly strong La Nina of 2010/11, which like the strong La Nina of 1973/74 produced record setting and very deadly outbreaks of tornadoes. Population growth and expansion outside urban areas have exposed more people to the tornadoes that once roamed through open fields. Tornado detection has improved with the addition of NEXRAD, the growth of the trained spotter networks, storm chasers armed with cellular data and imagery and the proliferation of cell phone cameras and social media. This shows up most in the weak EF0 tornado count but for storms from moderate EF1 to strong EF 3+ intensity, the trend slope has been flat to down despite improved detection. Our use of fossil fuels to power our civilization is not causing droughts or floods. NOAA found there is no evidence that floods and droughts are increasing because of climate change. The number, extend or severity of these events does increase dramatically for a brief period of years at some locations from time to time but then conditions return to more normal. This is simply the long-established constant variation of weather resulting from a confluence of natural factors. Wildfires are in the news almost every late summer and fall. The National Interagency Fire Center has recorded the number of fires and acreage affected since 1985. This data show the number of fires trending down slightly, though the acreage burned had increased before leveling off over the last 20 years. The NWS tracks the number of days where conditions are conducive to wildfires when they issue red-flag warnings. It is little changed. Weather and normal seasonal and year-to-year variations brings a varying number and extent of wildfires to the west every year and other areas from time to time. The 2016/17 winter was a very wet one in the mountains in the west, in parts of the northern Sierra, the wettest/snowiest on record). 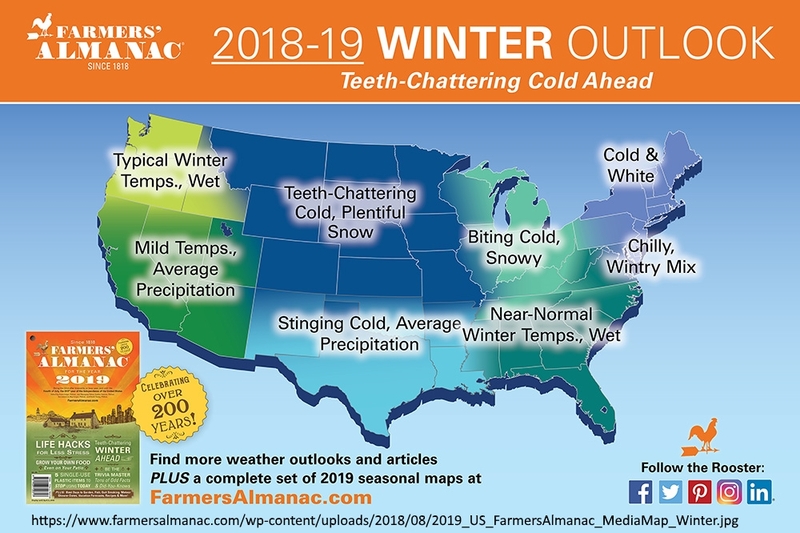 Wet winters cause more spring growth that will dry up in the dry summer heat season and become tinder for late summer and early fall fires before the seasonal rains return. 2017 was an active fire year in the U.S. but by no means a record. The U.S. had 64,610 fires, the 7th most in 11 years and the most since 2012. The 9,574, 533 acres burned was the 4th most in 11 years and most since 2015. 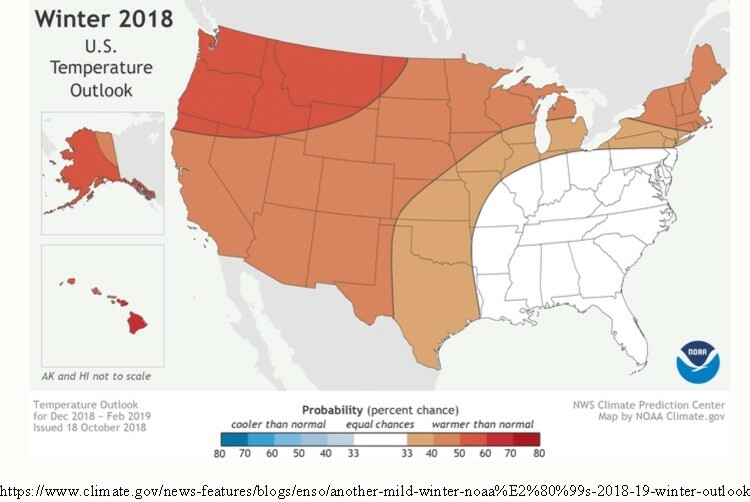 The fires burned in the Northwest including Montana with a very dry summer then the action shifted south seasonally with the seasonal start of the wind events like Diablo in northern California and Santa Ana to the south. Fires spread to northern California in October with an episode of the dry Diablo wind that blows from the east and then in December as strong and persistent Santa Ana winds and dry air triggered a round of large fires in Ventura County. According to the California Department of Forestry and Fire Protection, the 2017 California wildfire season was the most destructive one on record with a total of 8,987 fires that burned 1,241,158 acres. It included five of the 20 most destructive wildland-urban interface fires in the state’s history. When it comes to considering the number of deaths and structures destroyed, the seven-fold increase in population in California from 1930 to 2017 must be noted. Not only does this increase in population mean more people and home structures in the path of fires, but it also means more fires. Lightning and campfires caused most historic fires; today most are the result of power lines igniting trees. The power lines have increased proportionately with the population, so it can be reasoned that most of the damage from wild fires in California is a result of increased population not Global Warming. The increased danger is also greatly aggravated by poor government forest management choices. The explosive failure of power lines and other electrical equipment has regularly ranked among the top three singular sources of California wildfires for the last several years. In 2015, the last year of reported data, electrical power problems sparked the burning of 149,241 acres – more than twice the amount from any other cause. This is one claim that has been repeated for decades even as nature showed very much the opposite trend with unprecedented snows even in the big coastal cities. Every time they repeated the claim, it seems nature upped the ante more. Alarmists have eventually evolved to crediting warming with producing greater snowfall, because of increased moisture but the snow events in recent years have usually occurred in colder winters with high snow water equivalent ratios in frigid arctic air. The eastern United States as an example has had 29 high impact winter snowstorms in the last 10 years. No prior ten-year period had more than 10. Snowcover in the Northern Hemisphere, North America and Eurasia has been increasing since the 1960s in the fall and winter but declining in the spring and summer. However, as NOAA advised might be the case, snowcover measurement methodology changes at the turn of this century may be responsible for part of the warm season differences. This claim is demonstrably false. It really hinges on this statement: “Tide gauges and satellites agree with the model projections.” The models project a rapid acceleration of sea level rise over the next 30 to 70 years. However, while the models may project acceleration, the tide gauges clearly do not. All data from tide gauges in areas where land is not rising or sinking show instead a steady linear and unchanging sea level rate of rise from 4 up to 6 inches/century, with variations due to gravitational factors. It is true that where the land is sinking as it is in the Tidewater area of Virginia and the Mississippi Delta region, sea levels will appear to rise faster but no changes in CO2 emissions would change that. The implication that measured, validated, and verified Tide Gauge data support this conclusion remains simply false. All such references rely on “semi-empirical” information, which merges, concatenates, combines, and joins, actual tide gauge data with various models of the reference author’s choosing. Nowhere on this planet can a tide gauge be found, that shows even half of the claimed 3.3 mm/yr sea level rise rate in “Tectonically Inert” coastal zones. These are areas that lie between regions of geological uplift and subsidence. They are essentially neutral with respect to vertical land motion, and tide gauges located therein show between 1 mm/yr (3.9 inches/century) and 1.5 mm/yr (6 inches/century rise). The great Swedish Oceanographer, Nils-Axel Morner, has commented on this extensively, and his latest papers confirm this ‘inconvenient truth’. Furthermore, alarmist claims that “Satellites agree with the model projection” are false. Satellite technology was introduced to provide more objective measurement of the sea level rise because properly adjusted tide gauge data was not fitting Alarmists’ claims. However, the new satellite and radar altimeter data lacked the resolution to accurately measure sea levels down to the mm level. Moreover, the raw data from this technology also conflicted with Alarmists’ claims. As a result, adjustments to this data were also made – most notably a Glacial Isostatic Adjustment (GIA). GIA assumes that basically all land is rebounding from long ago glaciations and oceanic basins are deepening. The assumption is that this rebounding is masking the true sea level rise. Alarmists continue to proclaim that their models project a rapid acceleration of sea level rise over the next 30 to 70 years, when those same models have failed to even come close to accurately predicting the past 25 years. Satellite and surface temperature records and sea surface temperatures show that both the East Antarctic Ice Sheet and the West Antarctic Ice Sheet are cooling, not warming and glacial ice is increasing, not melting. Satellite and surface temperature measurements of the southern polar area show no warming over the past 37 years. Growth of the Antarctic ice sheets means sea level rise is not being caused by melting of polar ice and, in fact, is slightly lowering the rate of rise. Satellite Antarctic temperature records show 0.02C/decade cooling since 1979. The Southern Ocean around Antarctica has been getting sharply colder since 2006. Antarctic sea ice is increasing, reaching all-time highs. Surface temperatures at 13 stations show the Antarctic Peninsula has been sharply cooling since 2000. The Arctic includes the Arctic Ocean, Greenland, Iceland, and part of Siberia and northern Alaska. Because of the absence of any land mass in the Arctic Ocean, most of area lacks glaciers, which require a land mass. Thus, most of the Arctic contains only floating sea ice. Greenland, Iceland, northern Alaska, and northern Siberia contain the only glaciers in the general Arctic region. Because of the absence of any land mass in the Arctic Ocean, most of the Arctic contains only floating sea ice. Because the arctic ice is floating, it is subject to intrusians of warmer water under the ice during the natural multidecadal warm cycles especially from the North Atlantic, which thins the ice and reduces the ice extent in summer with its accompanying warmer air temperatures. Increased ice and colder temperatures are observed during cold water ocean cycles. Arctic temperature records show that the 1920s and 1930s were warmer than 2000. Official historical fluctuations of Arctic sea ice begin with the first satellite images in 1979. That happens to coincide with the end of the recent 1945-1977 global cold period and the resulting maximum extent of Arctic sea ice. During the warm period from 1978 until recently, the extent of sea ice has diminished, but increased in the past several years. The Greenland ice sheet has also grown recently. As the air’s CO2 content rises in response to ever-increasing anthropogenic CO2 emissions, more and more carbon dioxide is expected to dissolve into the surface waters of the world’s oceans, which dissolution is projected to cause a 0.3 to 0.7 pH unit decline in the planet’s oceanic waters by the year 2300. A potential pH reduction of this magnitude has provoked concern and led to predictions that, if it occurs, marine life will be severely harmed – with some species potentially driven to extinction – as they experience negative impacts in growth, development, fertility and survival. This ocean acidification hypothesis, as it has come to be known, has gained great momentum in recent years, because it offers a second independent reason to regulate fossil fuel emissions in addition to that provided by concerns over traditional global warming. For even if the climate models are proven to be wrong with respect to their predictions of atmospheric warming, extreme weather, glacial melt, sea level rise, or any other attendant catastrophe, those who seek to regulate and reduce CO2 emissions have a fall-back position, claiming that no matter what happens to the climate, the nations of the Earth must reduce their greenhouse gas emissions because of projected direct negative impacts on marine organisms via ocean acidification. The ocean chemistry aspect of the ocean acidification hypothesis is rather straightforward, but it is not as solid as it is often claimed to be. For one thing, the work of a number of respected scientists suggests that the drop in oceanic pH will not be nearly as great as the IPCC and others predict. And, as with all phenomena involving living organisms, the introduction of life into the analysis greatly complicates things. When a number of interrelated biological phenomena are considered, it becomes much more difficult, if not impossible, to draw such sweeping negative conclusions about the reaction of marine organisms to ocean acidification. Quite to the contrary, when life is considered, ocean acidification is often found to be a non-problem, or even a benefit. And in this regard, numerous scientific studies have demonstrated the robustness of multiple marine plant and animal species to ocean acidification – when they are properly performed under realistic experimental conditions. The term “carbon pollution” is a deliberate, ambiguous, disingenuous term, designed to mislead people into thinking carbon dioxide is pollution. It is used by the environmentalists to confuse the environmental impacts of CO2 emissions with the impact of the emissions of unwanted waste products of combustion. The burning of carbon-based fuels (fossil fuels – coal, oil, natural gas – and biofuels and biomass) converts the carbon in the fuels to carbon dioxide (CO2), which is an odorless invisible gas that is plant food and it is essential to life on the planet. Because the burning of the fuel is never 100% efficient, trace amounts of pollutants including unburnt carbon are produced in the form of fine particulates (soot), hydrocarbon gases and carbon monoxide. In addition, trace amounts of sulfur oxides, nitrogen oxides and other pollutant constituents can be produced. In the US, all mobile and industrial stationary combustion sources must have emission control systems that remove the particulates and gaseous pollutants so that the emissions are in compliance with EPA’s emission standards. The ambient air pollutant concentrations have been decreasing for decades and are going to keep decreasing for the foreseeable future because of existing non-GHG-related regulations. This in turn necessarily breaks the causal chain between CO2 emissions and the alleged knock-on effects of global warming, such as loss of Arctic ice, increased sea level, and increased heat waves, floods, droughts, hurricanes, tornadoes, etc. These alleged downstream effects are constantly cited to whip up alarm and create demands for ever tighter CO2 regulation. EPA explicitly relied on predicted increases in such events to justify the Endangerment Finding supporting its Clean Power Plan. But as shown above, there is no evidence to support such claims, and copious empirical evidence that refutes them. The enormous cost and essentially limitless scope of the government’s regulatory authority over GHG/CO2 emissions cannot lawfully rest upon a collection of scary stories that are conclusively disproven by readily available empirical data. The purpose of this article is to provide a quick reference to some of my articles dealing with climate so that you can cite facts to counter the ongoing scam. Climate has been constantly changing for billions of years and will continue to do so no matter what human do or don’t do. The major current controversy is that carbon dioxide emissions from burning fossil fuels will adversely affect global climate. However, there is no physical evidence to support that claim. The climate system consists of the sun acting upon two turbulent fluids, the atmosphere and the oceans. This is a coupled, non-linear chaotic system consisting of many variables. The notion that just one variable, carbon dioxide, which comprises just 0.04% of the atmosphere, is the major controlling factor, is absurd. Computer modeling is speculation, not physical evidence. Output from computer modeling of the climate diverges widely from observations because input assumptions are wrong. Correlation does not prove causation, but it may be suggestive. Still, correlation is not physical evidence. Consensus is merely opinion, not physical evidence. Remember back in the 1970s the scientific consensus was that Earth was about to enter another glacial epoch. The “greenhouse” hypothesis fails on four major predictions probably because it ignores convective heat transfer. The “greenhouse effect” does exist but water vapor is the major greenhouse gas. It’s the gravity of the planet and density of the atmosphere. We have a practical demonstration of this in the Grand Canyon. This shows that carbon dioxide has never been a controlling factor no matter what time scale is considered. In spite of rising sea level, islands are increasing in land area. It’s all about geology. Posted in Climate change and tagged carbon dioxide, climate, global warming, sea level on January 3, 2019 by wryheat2. Climate has been changing for about four billion years in cycles large and small. Climate will continue to change no matter what humans do or don’t do. Carbon dioxide emissions from burning fossil fuels are the major bogeyman of our time. As H.L. Mencken wrote: “the whole point of practical politics is to keep the populace alarmed and hence clamorous to be led to safety by menacing it with an endless series of hobgoblins, all of them imaginary.” As we will see below, neither increasing carbon dioxide emissions nor reducing such emissions will have a significant effect on global warming. Even the UN IPCC admits that the climate change bogeyman is about money and power, not the environment. The real goal of UN climate propaganda: “We require deep transformations of our economies and societies.” – UN climate chief Patricia Espinosa. “One has to free oneself from the illusion that international climate policy is environmental policy. Instead, climate change policy is about how we redistribute de facto the world’s wealth” — Ottmar Edenhofer, International Panel on Climate Change (IPCC). The real goal is one-world government. Let’s review the “greenhouse effect” to see if carbon dioxide is really a major factor in controlling global climate. 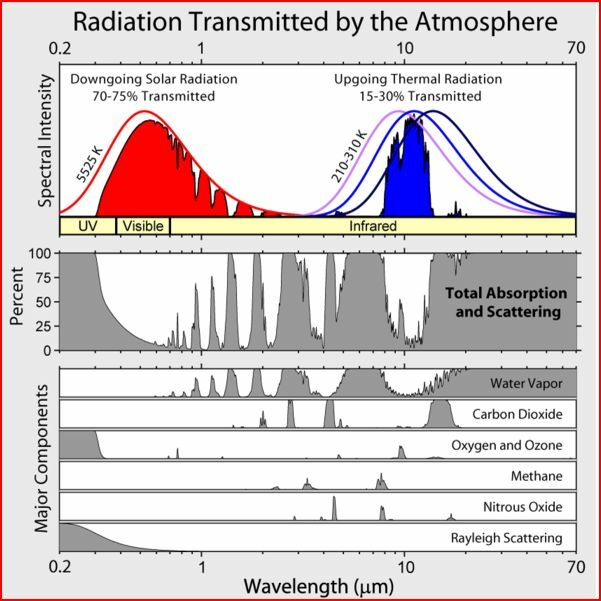 Greenhouse gases in the atmosphere intercept some of the long-wave infrared radiation and transfer some of the energy to excite (warm) other molecules in the atmosphere, some of the radiation goes back to the surface, and some of the radiation is radiated into space. The major greenhouse gas is water vapor which absorbs almost all wavelengths of infrared radiation. Carbon dioxide absorbs four specific wavelengths of infrared radiation, three of which are also absorbed by water vapor. Other minor greenhouse gases are oxygen and ozone, methane, and nitrous oxide. Once a particular wavelength becomes saturated, i.e., almost completely absorbed, additional quantities of greenhouse gases have no effect. Even the IPCC agrees that the hypothetical capacity of carbon dioxide to change temperature is given by the formula: △Tc = αln(C2/C1), where △Tc is the change in temperature in degrees Centigrade and the term ln(C2/C1) is the natural logarithm of the CO2 concentration at time two divided by the concentration at time one. The constant α (alpha) is sometimes called the sensitivity and its value is subject to debate. This relationship was proposed by Svante August Arrhenius, a physicist and chemist, around 1896. This logarithmic formula produces a graph in the form shown below. This shows that as the concentration of carbon dioxide increases, it has less and less influence. This graph is the pure theoretical capacity of carbon dioxide to warm the atmosphere in absence of any confounding feedbacks. The different curves represent different values of sensitivity. Carbon dioxide is currently about 400 parts per million (0.04%) of the atmosphere. Yet this nearly negligible amount is touted as the main driver of global temperature. 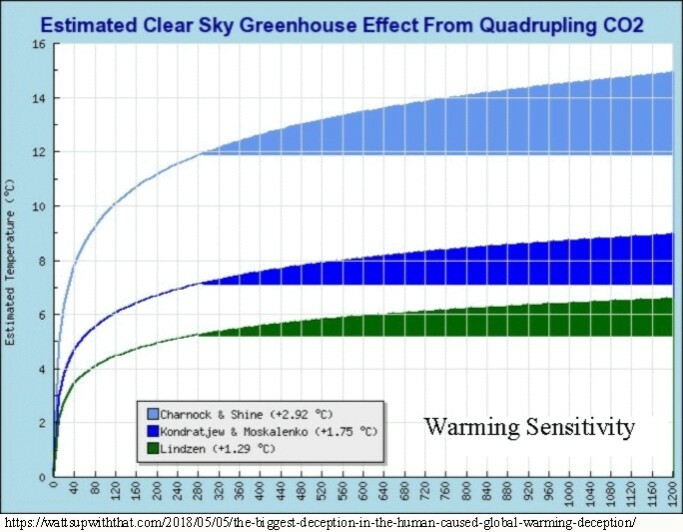 Notice that even at the highest sensitivity on the chart, doubling carbon dioxide from 400ppm to 800ppm results in a theoretical rise in temperature of only slightly more than 1°C – nothing to worry about. The climate system consists of two turbulent fluids (the atmosphere and the oceans) interacting with each other. As the IPCC rightly says in its Third Assessment Report: “In climate research and modeling, we should recognize that we are dealing with a coupled, non-linear chaotic system, and therefore that the prediction of a specific future climate state is not possible.” The claim that one minor variable acts as the major control knob is absurd. The term “greenhouse effect” with respect to the atmosphere is an unfortunate analogy because it is misleading. The interior of a real greenhouse (or your automobile parked with windows closed and left in the sun) heats up because there is a physical barrier to convective heat loss. There is no such physical barrier in the atmosphere. The greenhouse hypothesis deals only with heat transfer by radiation and completely ignores convective heat transfer. Convective heat transfer (weather) puts many holes in the “blanket” of carbon dioxide. The “greenhouse” is effectively broken. I have often heard it claimed that without the “greenhouse effect” Earth would be an iceball. Well, it ain’t necessarily so. There is an alternate hypothesis of what warms the atmosphere and this alternative is supported by physical evidence. Scottish physicist James Clerk Maxwell proposed in his 1871 book “Theory of Heat” that the temperature of a planet depends only on gravity, mass of the atmosphere, and heat capacity of the atmosphere. This happens regardless of atmosphere composition. Greenhouse gases have nothing to do with it. Physical evidence supports this hypothesis. See more of this story here: What keeps Earth warm – the greenhouse effect or something else? A simple question for climate alarmists – where is the evidence. The global push for renewable energy generation of electricity is based on the false premise that we need to reduce carbon dioxide emissions to forestall dangerous warming. How much warming is dangerous? The IPCC says 2°C is dangerous. They are ignoring the Cretaceous Period when global temperature was at least10°C warmer and the Paleocene-Eocene when temperatures were up to 19°C warmer. (link) The IPCC’s arbitrary 2ºC (3.6ºF) “tipping point” has no basis in science. 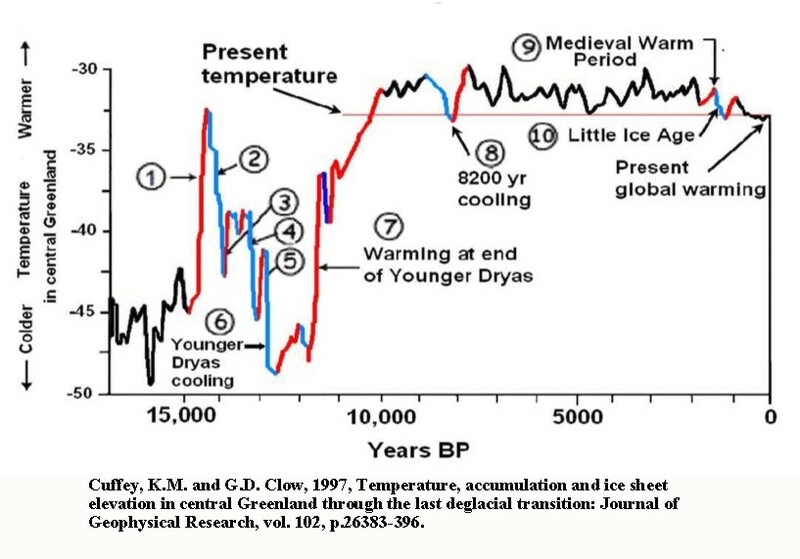 In fact, during the last 10,000 years, the temperature has cycled several times through warm and cool periods of 2ºC or more. This paper shows that if Arizona stops all carbon dioxide emissions it could possibly prevent a rise in temperature of 0.0029°C by 2100. If the entire U.S. stopped all carbon dioxide emissions it could prevent a temperature rise of 0.172°C by 2100. This article by meteorologist Joe Bastardi explains how water vapor moderates temperature. Much of the climate scaremongering is based on climate models. 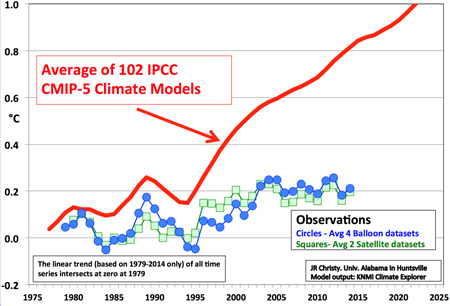 Climate models are complex mathematical constructs, not physical evidence. But the atmosphere is even more complex, so modelers must ignore many variables such as Sun-Earth relationships and clouds, in favor of a few basic parameters. The fundamental assumption of climate models is that changes in CO2 concentration drives temperature change, but evidence from geology and astronomy show that the relationship is just the opposite. Temperature drives atmospheric CO2 concentration because temperature controls CO2 solubility in the oceans.